This conversation is sparked by a comment made during a Roundtable – specifically, that confident, strong women find themselves in polarized relationships with other women who might, for example, find fault with actions or lash out at women perceived to have different perspectives. Specifically around what societal changes are necessary to create equality for women. The implication? That there is disparity around the goals we as women have. When I reflected on my definition of feminism I realized that it varied, ever-so-slightly, from some of the confident, strong women who displayed vulnerability in our group discussion. Upon some investigation, I identified five different forms of feminism. When crossed with the places where feminist movements exist … well, there are many, many variations. If you are in the Greater Denver area, join us in person March 23. Register here! Liberal Feminism. Started by Abigail Adams and Mary Wollstonecraft, this category includes those – then and now – who strive to focus (then and now) on integrating women into society. Suffragists are also part of this group. Radical Feminism. Born during the Civil Rights Movement, this type focuses on anything oppressive with the goal of transforming society. Marxist and Socialist Feminism. Individuals in this category believe in overthrowing the existing systems that allow oppression to exist. Cultural Feminism. This includes people “working to build a women’s culture” … implying that women are far different from men. Eco-Feminism. This is the most spiritual type, who hold the view that women as nurturers would not harm the planet (or any being on it) for their own benefit (as the patriarchal systems have). You can find the aforementioned definitions of feminism, book references (and more) summed up here. Feminism is our truth. And, it’s perfectly diverse. Different truths offer a way to challenge ourselves and our beliefs; to uncover areas where we have limited our thinking. Experiences of others expand our world view … we learn from their stories, which shape our own. Understand that what we think is wrong about someone else’s viewpoint may be right. Walk our own talk with an innate openness, in order to be accountable to ourselves and others. Pause to breathe, to process, and to allow for a thoughtful response. Despite such enhanced insight leadership roles provide, sometimes we think we are being judged or left out by other women. What causes this response? And what is the past conditioning that makes us feel more separated than connected? How do we, as feminists come together when there are so many differences among us? So what does this mean for us, right now, in the world? 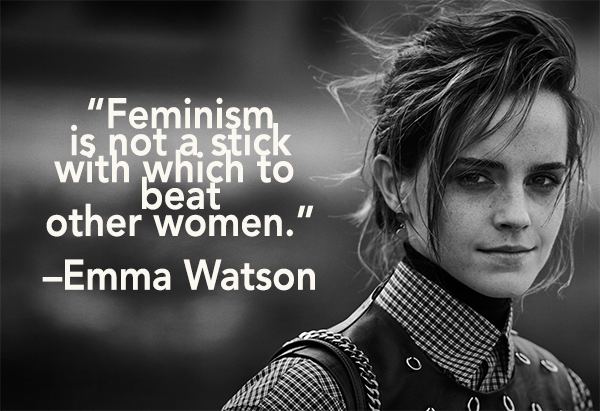 What does it mean to be a feminist today? What does it mean to want people to also be feminist? And, how do we know when we’ve met a feminist? What are the places where we overlap with the people around us, and where we can come together for the change we want? We want to feel united in our beliefs and paths, not disconnected and alone. A good place to start? Remembering the commonality shared by all forms of feminism – a grievance about injustice done to women. Then, use past experience to inform what’s happening and be cognizant of the point at which we make a choice. Awareness is the key to effect this coming together, and change itself. Listen to this Voice of BOLD Business Radio broadcast for an in-depth discussion about the Power of Awareness. If you are in Denver area please join us on March 23 at Denver Tech Center. Register for Women’s Leadership Roundtable.